Air Products & Services was founded in 1979 by a team that has extensive knowledge and skills in the HVAC industry. Since our inception nearly 40 years ago, we have grown to become one of the top HVAC companies in the San Fernando Valley. Offering a full range of services, including installations, repairs, replacements, preventive maintenance and more, our entire team is dedicated to maximizing indoor comfort and leaving customers completely satisfied. Get in touch with us at (818) 989-2030 today to learn more about our services or to schedule your visit from a friendly and professional Air Products & Services technician. Our mission at Air Products & Services is to make people comfortable and improve the quality of the air that they breathe. Our unwavering commitment to doing a job the right way makes us the HVAC company you want to work with. With a punctual team and customer-first approach, we take care of our customers so that they have the best experience possible. Our Facility. Our office, parts division and warehouse are located within a modern commercial building near the Van Nuys Airport in Van Nuys, California. Installation Department. Dependable and qualified professionals make up our installation crews. Our crews are equipped with the most updated tools and equipment, and we are willing to accommodate your schedule. Please feel free to verify any of our references! 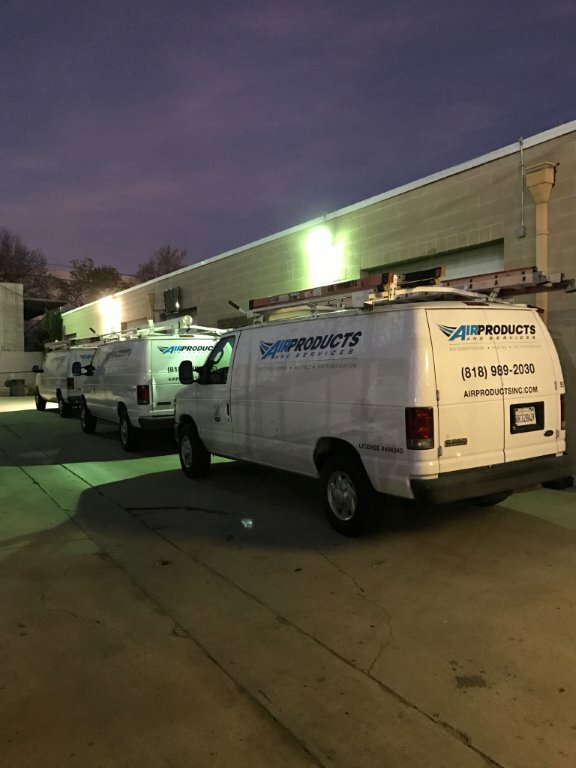 You can trust us to be dependable, punctual and to follow the timeline to provide you with the best service and installation. Service Department. Our factory-trained technicians and fleet of service trucks are on call to provide emergency maintenance as needed. Every truck is equipped with a full inventory of equipment and parts for replacement. We also maintain refrigerant recovery units to prevent illegal venting to pollute the environment. Preventive Maintenance. Preventive maintenance programs are suited to accommodate the individual needs of each client. Our agreements prove to be a wonderful way to limit the otherwise costly repairs and service of equipment. Preventative maintenance also serves to extend the lifetime of your system. At Air Products & Services, customer service is incredibly important to us. Because of this, we’re proud to have earned a number of awards and recognition for our outstanding services and fantastic customer care. We’ve been honored by Angie’s List, earned the 2016 President’s Award from Carrier, are NATE-certified, and have an A+ rating with the BBB. Plus, people love us on Yelp! We’re proud of our countless 5-star ratings and strive to always provide a truly superior level of service for every customer. Are you ready to choose Air Products & Services as your trusted HVAC provider? With our extensive industry knowledge and NATE-certified technicians, you will receive the results that you need. Call us today at (818) 989-2030 or submit an online form. We look forward to serving you in your home or business!